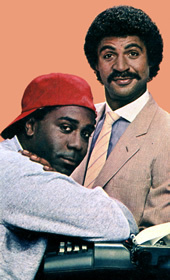 Performers include: Ron Glass, Demond Wilson, John Schuck, Sheila Anderson, Bart Braverman, and Ronalda Douglas. When freelance photographer Felix Unger (Ron Glass) is thrown out of his New York apartment by his wife Frances (Telma Hopkins), he moves in with his friend Oscar Madison (Demond Wilson). Oscar is a sports-writer for a New York newspaper and is assisted by his secretary, Maria (Liz Torres). Felix hopes to reunite with his wife one day while Oscar has been happily divorced from his wife, Blanche for many years. Oscar and Felix are close friends but frequently drive each other crazy with their personal habits — Felix is compulsively neat and Oscar is incredibly messy. The pair’s poker-playing buddies include oafish Murray the Cop (John Schuck), accountant Roy (Bart Braverman), and compulsive gambler Speed (Christopher Joy). Their upstairs neighbors are the delightful and lighthearted Pigeon sisters; Gwendolyn (Ronalda Douglas) and Cecily (Sheila Anderson). The show is a remake of the 1970-83 series and several scripts were adapted slightly and recycled for the new series.